Pioneering librarian Caroline M. Hewins, who came to Hartford from Boston in 1875 and lived here for 50 years, helped establish what we know today as the Hartford Public Library. She was also a true collector. Miss Hewins collected dolls from other countries, books for children written in many languages, and Valentine’s Day cards. Her Valentines were kept in an 8-inch-by-10-inch cloth-covered scrapbook, as was tradition throughout the Victorian era. The celebration of Valentine’s Day began in Europe during the 1300s. Colonists brought their custom of exchanging tokens and love notes with them to America as early as the 1600s, but such practices were frowned upon by the Puritans as being too frivolous. The Valentine’s Day traditions we are the most familiar with became popular in the 19th century as more people were able to read and write. We can thank Esther Howland of Worcester, Massachusetts, for the printed Valentine’s Day greetings we see in stores today. Miss Howland was given an elaborate lacy Valentine by a business associate of her father’s and was inspired to found the New England Valentine Company in 1847. Considered the “Mother of American Valentines,” Esther Howland took orders for Valentines which were then assembled from imported lace, decorative paper, and ribbons. 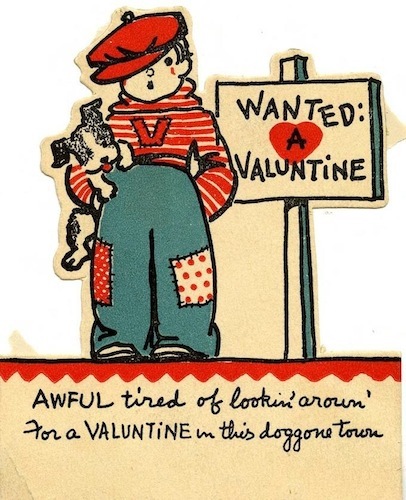 Sending Valentines was so popular during the late 1800s and early 1900s that women often displayed their scrapbook-bound card collections in the parlor, and visitors were welcome to flip through the pages. It wasn’t unheard of for admirers to spend upwards of $100 on elaborate, multi-dimensional Valentine’s Day cards to impress their beloveds. All of the cards in this display, seen here for the first time in decades, are from Miss Hewins’ scrapbook, which is housed in the Hartford Public Library’s Hartford History Center. The Center gratefully acknowledges Jennifer Chretien and Anne Farrow for their work on this exhibition.